The cast of Prom Night in Mississippi does a Q&A after the packed out (three theaters worth!) screenings at the 2009 OFF. Although co-director (aka rock star) Michelle may not be willing to brag about herself on here, I am! Michelle worked all last weekend to resolve ongoing issues with our Web site in order to finally be able to post up our 2009 images. Thanks to her, from now on, images will go up much more often and in a much more timely fashion. Co-director Molly Fergusson and filmmaker Craig Brewer at the awards ceremony. Missing the film fest? 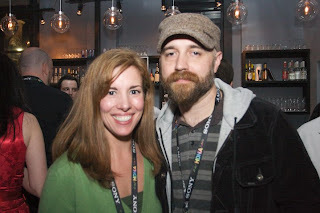 Visit http://www.oxfordfilmfest.com/gallery.html and relive the moments. Remember when director and actor Giancarlo Esposito hung out at Donna Ruth Roberts house? 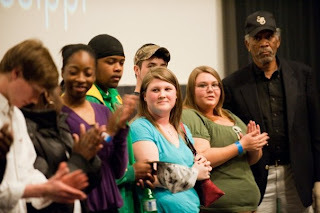 Remember the great Q&A from Prom Night in Mississippi including Morgan Freeman and director Paul Saltzman? Remember some of the more zany late night antics? Remember Jason Ritter and James Rocchi breaking it down on the dance floor? Join us in remembering how great 2009 was by taking a trip down memory lane. And thank you, as always; it was because of all of you that participated that the film festival continues to be a success. As our early bird deadline approaches (July 15! ), we are gearing up for the 2010 film festival. Looking back fondly at 2009, we can't wait to see what happens next!